Looking for a bit of weekend wanderlust? Can you imagine what it would be like to stay in a modular perched high on top of an office building in the middle of a CBD? Well, that’s what you can expect when you stay at the Avalon City Retreat in Hobart, Tasmania. Avalon City Retreat is a luxury, modular designed ‘Omnipod’ that is cantilevered off each end of an 1967 office tower – a spectacular sight to see from street level. Located in the middle of Hobart’s CBD, this large five part modular pod can go anywhere – on top of a building, barge, cliff or backyard. In fact, you can have one of your own for about AUD $400,000 plus transport and installation! An inner city retreat for everyone to enjoy, my review of the Avalon City Retreat is part of a new series on Mister Weekender – ‘Nomadic Interiors’ – where I’ll be collaborating with Christina Symes and Jessica Stewart, interior and design experts from Triibe. The girls will travel the world with me as I review high end boutique hotels and retreats with a key focus on interiors. They’ll provide tips and advice for reinventing and redefining the way you create your own space, by profiling the amazing places we stay. "Prior to arriving at Avalon City Retreat in Hobart, it was as though we were going to see a movie without watching the trailer, completely unbeknownst for what was yet to come. Admittedly we hadn’t done our research, aside from looking at some imagery and acknowledging that it looked like a pleasant stay, we were clueless as to what this place had on offer. Thankfully, this turned out to be the best unintentional strategy," says Christina Symes. "On arrival, we were escorted up to the accommodation through an eight-storey, 1967 Boyd-era office block with a dated corporate interior, nothing of which eluded us to believe our accommodation would be as spectacular as it turned out. What seemed to be a fire escape was in actual fact our front door opening up to the entrance of the apartment and our private balcony on the building roof top, it was (to say the least) beyond anything we could have imagined. "In front of us lay a perfectly perched prefabricated omnipod situated on top of the office block, with glass windows stretching along either side, our accommodation boasted sweeping views across Hobart. With two bedrooms cantilevering off either end and a spacious living and balcony area centralising the pod, we were most certainly ready to make ourselves at home. "Whether it was reading a book in bed with a sense of levitation eight-storey’s above ground, indulging in a glass of champagne whilst immersed in the outdoor Huon pine bathtub, or feasting on a smorgasbord of fresh and local produce provided upon arrival, Avalon City Retreat said it best “this soothing sanctuary is an oasis, a memorable escape from ‘the circus’. "This prefabricated, modular dwelling was a collaborative project between Rosevear Architects and developer Brett Torossi; it explores the ideas of adaptable inner-city living and can be all yours for a cool AUD $400,000 plus transport and installation. Our favourite design feature? 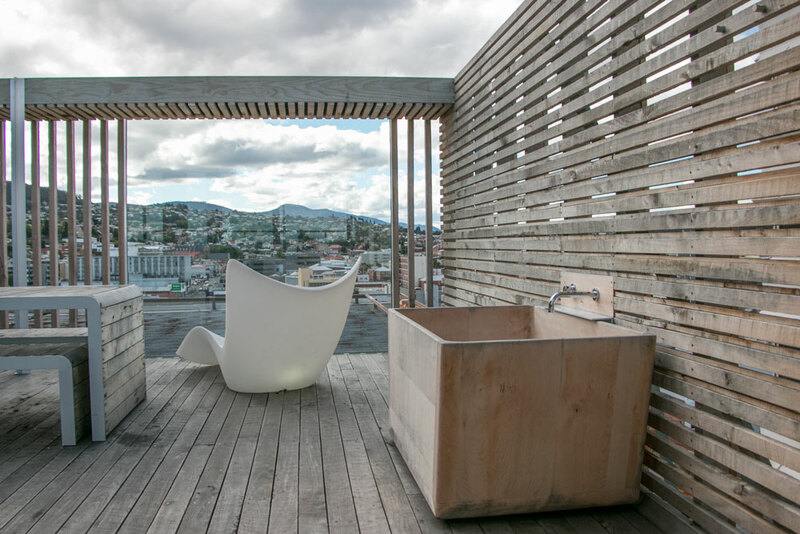 The outdoor balcony area of course, with a large bleached timber dining table, illuminated moon lounge, and wooden Huon pine bathtub situated against the backdrop of timber decking and a timber-clad wall, it was solitude bliss after a busy day seeing the sights of Hobart." For your own a slice of wanderlust and to find out how to recreate the incredible Avalon City Retreat outdoor area in your space – and don’t worry, you can do this without the view - head over to Triibe where they share three tips to make it happen. So after luxuriating, eating, resting, reading and having inner city outdoor bubble baths, what else is there to do in Hobart? Plenty! Take a look at my free itinerary for those who have a day to explore this beautiful Australian city – here. And in case you haven’t seen it, make sure you check out my review of Avalon’s sister property in Freycinet, Avalon Rocky Hills Retreat – here. It is by far my favourite place I’ve stayed. Tucked high on a mountain and nestled privately amongst thick native trees and bushes, with its sweeping vistas of the ocean, roaring fireplace, outdoor bathtub, cosy couches and library, you wouldn’t ever want to leave. DOWNLOAD MY FREE PRINTABLE ROAD TRIP CHECKLIST!